Illegal immigrants could become citizens in 15 years under legislation being drafted by a bipartisan group of House lawmakers, a timeline two years longer than under a similar Senate bill. The timeline was one of the few specifics to emerge Friday from an "agreement in principle'' that a so-called gang of eight House lawmakers struck Thursday evening on a broad overhaul of immigration laws. Details that trickled out suggested that the House plan would diverge in some important areas from a bipartisan Senate bill, differences that House Republicans said would make the plan more palatable to their GOP colleagues. "Our bill has a better chance of passing the House than the Senate bill," Rep. John Carter (R., Texas) said Friday. 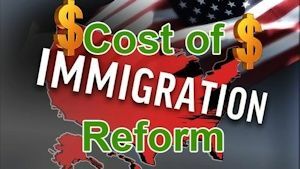 Both the House and Senate plans would make the 11 million illegal immigrants already living in the U.S. wait 10 years before being eligible for permanent legal status, also known as a green card. But under the House plan, it would take an additional five years to become a citizen, as it generally does under current law. The Senate bill would shorten that to three years. I can't even consider supporting ANY Immigration Bill that does not INSURE the border is secure BEFORE anything else happens.